An aura of mystery, romance, and danger surrounds the French Foreign Legion, the all-volunteer corps of the French Army, founded in 1831. Famous for its physically grueling training in harsh climates, the legion fought in French wars from Mexico to Madagascar, Southeast Asia to North Africa. 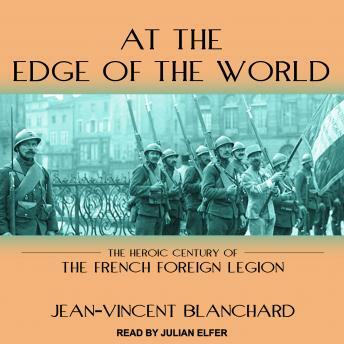 In At the Edge of the World, historian Jean-Vincent Blanchard follows the legion's rise to fame during the nineteenth century-focusing on its campaigns in Indochina and especially in Africa-when the corps played a central role in expanding and protecting the French Empire. As France struggled to be a power capable of rivaling the British, the figure of the legionnaire came to represent the might and morale that would secure a greater, stronger nation. Drawing from rare, archival memoirs and testimonies of legionnaires from the period and tracing the fascinating career of Hubert Lyautey, France's first resident-general in Morocco and a hero to many a legionnaire, At the Edge of the World chronicles the Foreign Legion at the height of its renown, when the corps and its archetypically handsome, moody, and marginalized recruits became both the symbols of a triumphant colonialism and the stuff of legend.